The K&N 77-9025KP high-flow performance air intake system is a free-flowing, mandrel-bent aluminum tube air induction system designed to fit some Toyota Tundra models. 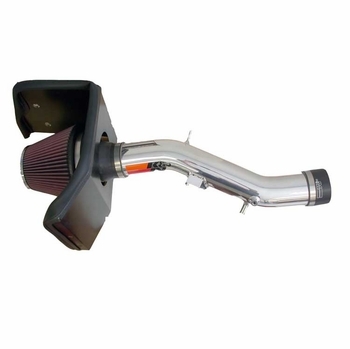 The restrictive factory air filter and air intake housing on your vehicle are replaced by this K&N air intake system which is designed to dramatically reduce air flow restriction as it smoothes and straightens air flow. The improved air flow allows your engine to inhale a larger amount of air than it would from the stock air intake. More air means more usable power and acceleration throughout your engine's RPM range. 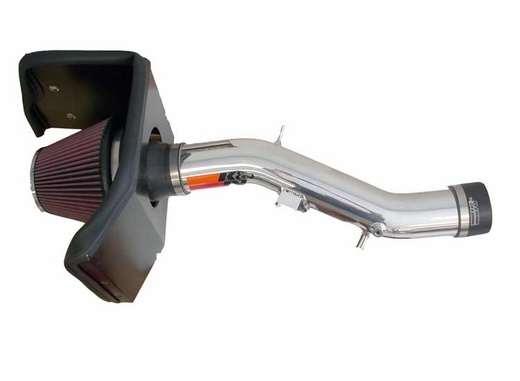 The 77-9025KP air intake comes with a chrome topped K&N high-flow air filter and a heat shield that installs into the previous air box space. Air is directed through the intake tube into the engine's throttle body for a guaranteed power gain. The intake tube has an attractive chrome-like finish that's made to last and it accommodates the factory mass air sensor and crank case vent hose as well as a replacement silicone vacuum hose for the fuel pressure regulator. The oversized cone shaped air filter can be used for up to 100,000 miles before servicing is needed depending on driving conditions. This air intake is relatively easy to install usually in 90 minutes or less using existing factory mounting points. The tools needed are a screwdriver, ratchet set and some wrenches. Some K&N 77 series air intakes are not legal for sale or use in California and other states adopting California emission standards while others are CARB exempt and 50 state legal. Check the K&N catalog or website for vehicle applications and specific CARB status for each vehicle and air intake.